Pity that gold should always bring with it the canker — covetousness. Our domestic Napoleons, too many of them, give flattery, bonnets and bracelets to women, and everything else but — justice. What a pity when editors review a woman's book, that they so often fall into the error of reviewing the woman instead. Blessed be sleep! We are all young then; we are all happy. Then our dead are living. Preface. Excuse me. None this time. There have already been too many big porticos before little buildings. Altogether, he's about as genial as the north side of a meeting-house. Can anybody tell me why reporters, in making mention of lady speakers, always consider it to be necessary to report, fully and firstly, the dresses worn by them? When John Jones or Senator Rouser frees his mind in public, we are left in painful ignorance of the color and fit of his pants, coat, necktie and vest - and worse still, the shape of his boots. This seems to me a great omission. I am getting sick of people. I am falling in love with things. They hold their tongues. When a literary person's exhaustive work is over, the last thing he wishes to do is to talk books. I hate the word proper. If you tell me a thing is not proper, I immediately feel the most rabid desire to go 'neck and heels' into it. Too much indulgence has ruined thousands of children; too much love not one. You are taken sick; you send for a physician; he comes in, stays ten minutes, prescribes for you a healing medicine, and charges you three or four dollars. You call this 'extortionate' - forgetting the medical books he must have waded through, the revolting dissections he must have witnessed and participated in, and the medical lectures he must have digested, to have enabled him to pronounce on your case so summarily and satisfactorily. O, girls! set your affections on cats, poodles, parrots or lap-dogs; but let matrimony alone. You labor under the hallucination that I felt merry when I wrote all that nonsense! Not a bit of it; it's a way I have, when I can't find a razor handy to cut my throat! Uncles, and aunts, and cousins, are all very well, and fathers and mothers are not to be despised; but a grandmother, at holiday time, is worth them all. The tiny feet that crept, mice-like, in and out from under the sweeping folds of her silken robe. Now I am in for it, with one of my unappeasable headaches. Don't talk to me of doctors; it is incurable as a love-fit. 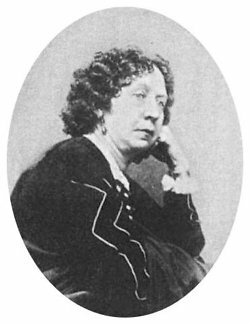 Bio: Fanny Fern, born Sara Willis, was an American newspaper columnist, humorist, novelist, and author of children's stories in the 1850s-1870s.